Why Choose the Family Nurse Practitioner Concentration? Family Nurse Practitioners are advanced practice nurses who have received the additional education and training necessary to provide primary health care, health information, and community-based case management in many settings. As a graduate from the Wright State University Family Nurse Practitioner concentration, you will be able to help meet the growing demand for primary care and preventive care in settings where the services of health care professionals are needed. Graduates are eligible for certification through the American Nurses Credentialing Center (ANCC) and the American Associate of Nurse Practitioners (AANP). The Family Nurse Practitioner concentration consists of 49 credit hours. All students are required to complete a graduate level statistics course prior to NUR 7005: Nursing Research and Evidence for Practice course. Students are admitted only summer or fall term. Individualized plans, including part-time, will be developed on admission by the associate director of the concentration. Please see the following sample curriculum plan for a full-time student. The concentration can be completed online; however, all students must come to campus five times during the online study: Orientation and for final examinations and OSCE standardized patients at the end of each term. 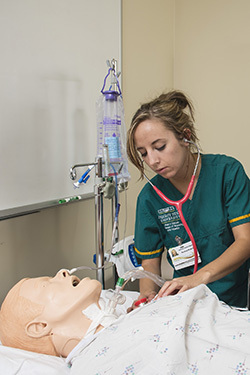 Application to Wright State University’s College of Nursing & Health is a two-step process. Required Documents: the documents listed below should be uploaded directly to your School of Graduate Studies online application. Please do not send these materials to the College of Nursing & Health. When the School of Graduate Studies application is complete, notification will automatically be sent to the College of Nursing & Health, and we will communicate our application requirements. The College of Nursing & Health will provide instructions on how to complete the above steps once we receive notification of the completed School of Graduate Studies application. All CoNH required documents should be sent directly to the CoNH. Have a minimum of two years of full-time post-BSN nursing experience. Provide evidence of no criminal record on file through a clear BCI / FBI background screen. Must have an unencumbered United States nursing license.